View of Nan Madol islet complex. Computer based reconstruction of main islets and features, including selected house structures. The main Pahn Kadira (PKI) islet, the residential complex of the Sau Deleur chiefs, is 115 meters long. 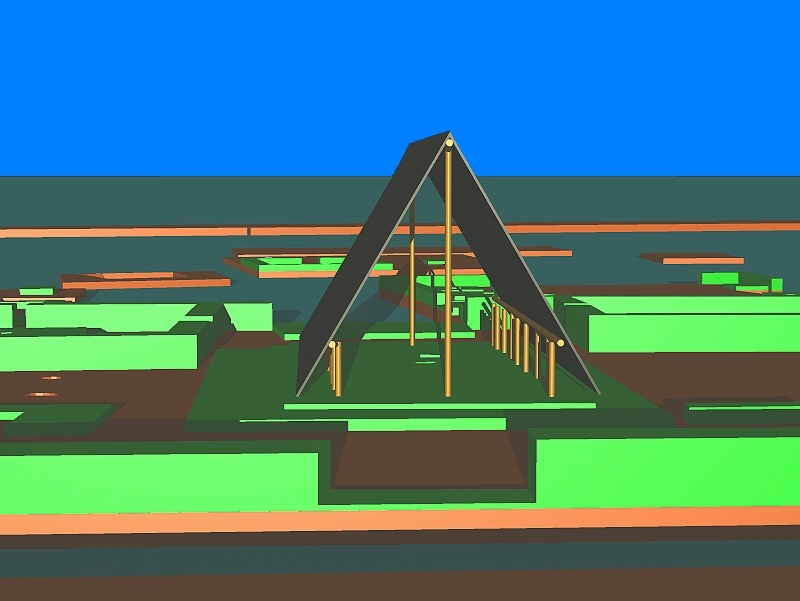 Image developed from original archaeological field maps using Intergraph Corporation's Microstation software running on a PC. Nan Madol reportedly was the ceremonial and political seat of the Sau Deleur dynasty which united Pohnpei's estimated 25,000 people in late prehistoric times. Oral history as well as archaeological evidence substantiate Nan Madol's position as the island's preeminent political and religious center up until the A.D. 1500s when the centralized system collapsed. Today Nan Madol forms an archaeological district covering more than 18 sq. km and includes the stone architecture built up on a coral reef flat along the shore of Temwen Island (Nan Madol Central), several other artificial islets, and the adjacent Pohnpei main island coastline. 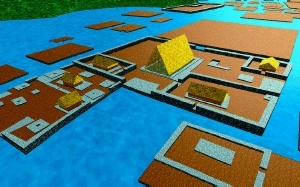 The site core with its stone walls encloses an area approximately 1.5 km long by 0.5 km wide and it contains nearly 100 artificial islets--stone and coral fill platforms--bordered by tidal canals. I estimate that between 500,000 and 750,000 metric tons of building material were transported from varying distances into the site. My research provides basic information on Nan Madol and more than 200 other Pohnpeian sites useful for placing it in an island-wide context. Individual platforms and large artificial islets mapped in my projects illustrate complex distributions of surface architecture, artifacts, and food refuse. Excavations designed to reveal architectural building stages and style changes verify more than 2000 years of occupation and possibly a 1000 year span of major construction activity from A.D. 500 to 1500. In 1986 three field seasons were planned to establish the overall Nan Madol developmental sequence and to clarify its relationships to other Pohnpei sites. The project has been supported by the National Endowment for the Humanities, private matching funds, and substantial donated field time by myself and other participants. The Historic Preservation Offices of Pohnpei State and the Federated States of Micronesia have been centrally involved in these projects. Portable artifacts recovered at Nan Madol number several thousand and include shell tools and ornaments, pottery, and stone tools. Food remains that provide a basis for dietary and activity pattern reconstructions have been collected from a variety of contexts. Nan Madol ceramic collections show considerable variability suggestive of major stylistic changes and non-local production sources typical of chiefly exchange. The results of islet mapping and testing provide chronological control over intra-site stylistic and functional variation in ceramics and shell artifacts. Representative samples of the site's major architectural clusters and of other sites which represent different functional and temporal variations are available. Patterning studies indicate a correlation between high status remains (artifacts, food remains, and architecture) and certain islets. Computer-generated artifact point plots have been useful and isometric projections of several islets and architectural features provide detailed reconstructions. Underwater archaeological survey and provenance studies of building materials are also being completed. A good overview of all Nan Madol islet types and locations, a significant sample of subsurface deposits, detailed maps and reconstructions of more than 20 islets, and good controls over the architectural buildup at the site are available. Questions remain about Nan Madol's purposeand context within the broader Pohnpeian sociopolitical system, and thusa comprehensive assessment and integration of available information is essential. I am now working on new data related to prehistoric artifact and building sequences, analyzing architectural features with their associated artifact surface distributions, and relating the development of this unique site complex to long-term cultural change and structural evolution on Pohnpei and on Pacific islands in general. Plan view of an early artificial islet, Nan Madol, Pohnpei, Federated States of Micronesia. Dauahdpeidak Islet (DPK) is shown here with red color outlines marking the basalt boulder or column construction stones of the islet retaining wall. Blue indicates surface stone features and architecture. 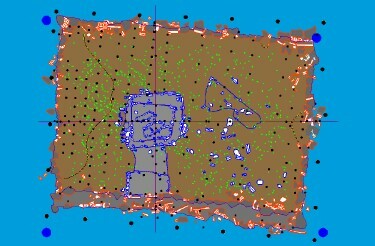 Black points represent surface mapping control points and green locates individual pot shards found as surface artifactual remains. The blackline on the left is the edge of a tidal erosion pattern affecting the sitesurface. The islet is 30 meters long. View of reconstructed temple structure on Pohn Kadira islet, Nan Madol. Looking to the southwest. 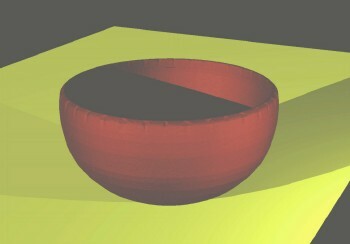 Computer reconstruction of an early pottery form, an open bowl, of thetype produced on Pohnpei, Federated States of Micronesia, approximately 1,000 years ago. The conjectural reconstruction is based on shards excavated from archaeological sites; no locally produced pottery is known from recent times. Ayres, William S. Nan Madol, Pohnpei. SAABulletin. Vol. 10, Nov. 1992. Society for American Archaeology.